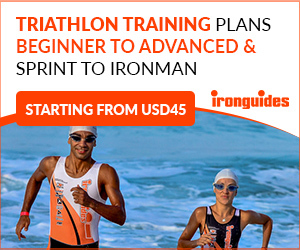 Andreas Dreitz of Germany, on the strength of his race-best 2:16:18 bike split won the Ironman 70.3 European Championship at Wiesbaden, Germany with a time of 3:59:05. 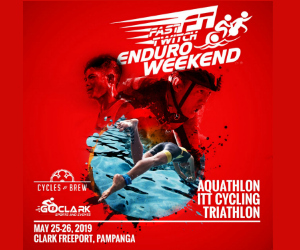 After trailing by 40 seconds on the swim, he blitzed the bike, and surged to the lead after only 20 kilometers on the bike. His marvelous bike split allowed him to create a 3:19 cushion, that eventually led to the win. Runner-up Lionel Sanders of Canada, who ran a race-best 1:09:20 run split was 1 minute and 18 seconds behind Dreitz. Fellow German Boris Stein, finished third at 4:00:42. “I was surprised that everything worked out so well. In the past, I didn’t really show my personal best in this race. I learned to love this course today. It was my goal to keep a gap to Boris and Lionel, I’m full of respect for Boris and Lionel – they had huge results this year. It was a very emotional finish for me.” Dreitz said at the press conference. 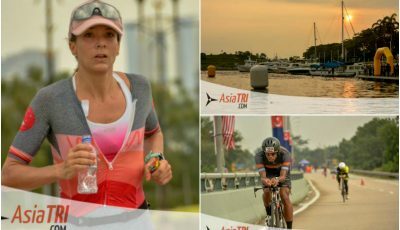 Melissa Hauschildt once again relied on her bike-run strength to overcome a 2 minute 34 second deficit after the swim to Jodie Swallow of Great Britain to win with a time of 4:27:35. Her bike-run splits of 2:36:48 and 1:18:46 were both the best in the women’s category. 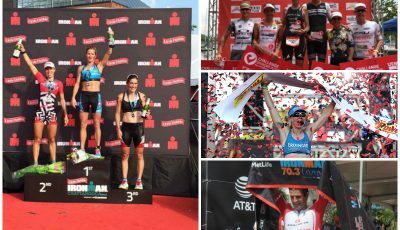 Hauschildt, a 2-time Ironman 70.3 world champion, easily won with a 5:28 margin over swallow and 6:30 over third placer Laura Philipp of Germany. S 1.9 km. / B 90 km. / R 21 km. American Brad Williams secured his breakthrough victory at IRONMAN 70.3 Chungju, Korea after a commanding performance. Equally dominant was the effort of Australian Sarah Crowley who won the women’s race in 4:33.32, which was the third fastest time overall. Williams, who spent his early life in the US Air Force based in South Korea, found himself at home with a dominant performance. He led out of the water in 27:37 along with Seychelles pro Nick Baldwin who had opened by a 3:30 lead on Romania’s Zsombor Deak with a further two minutes to Korea’s Younghwan Oh. Williams and Baldwin cycled together for 30kms before the American made his move, and from that point managed to ride away to open an eight minute advantage. While Baldwin is a noted runner, he was unable to make any grounds on Williams who managed a 1:31.40 effort for the 21.1km in blistering hot conditions. Baldwin was second nearly 10 minutes back with Deak another 15 minutes in arrears. With only two professionals in the field, the challenge for Australian Sarah Crowley was where she finished in relationship to the men. Her 4:33.32 effort placed her third overall behind Williams and Baldwin. She was 27:45 in the swim, right up with the men, before a 2:34.04 bike and outstanding 1:29.30 run, the best of all pros male and female. 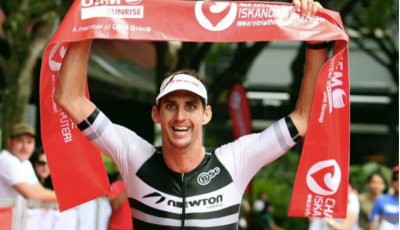 It follows on from an excellent season for Crowley who was third in the IRONMAN 70.3 Asia-Pacific Championship in Cebu last week, and third in the IRONMAN Asia-Pacific Championship in Cairns. Ben Collins of the USA had to rely on his 3rd best swim of 23:11 and 2nd best bike split of 2:08:07 to ward off Irish age-grouper Bryan McCystral by just 15 seconds to take the win in Ironman Dublin 70.3. Ben Collins who won with a time of 4:00:41, struggled on the run, but had enough lead on the 2nd pro Harry Wiltshire of Great Britain by more than 11 minutes going into T2. McCrystal, the local favorite, had the race-best bike split of 2:06:34, finished 2nd overall with a time of 4:00:56. Fourth overall also went to an age grouper, Andy Greenleaf (GBR), who had the day’s best run split of 1:11:46. Susie Cheetham of Great Britain, on the strength of her women’s best 2:27:21 bike split won over fellow countryman Natalie Seymour with a margin of 4 minutes and 15 seconds. Despite trailing in the swim by 1 minute and 11 seconds to age-grouper Claire Hann of Great Britain, she took control on the bike and was never threatened on the run. Despite having the best run split of 1:21:53 among women, Seymour cannot overcome the 4 minutes 26 second deficit to CHeetham going into T2. 3rd overall went to age-grouper Sarah Lewis (GBR) who finished in 4:31:54.